AMURT Romania has been providing vocational skills and housing to vulnerable young people, many homeless, since 1990. The project started life as a small children’s home in the Domnesti village near Bucharest to provide a loving, child centred alternative to the under-resourced government children’s homes. Since then the centre has evolved into a pioneering housing and training project with a small farm, vocational skills workshop and training kitchen to prepare vulnerable young people to become productive members of society. The centre is currently undergoing a long term renovation project to expand and improve the centres housing capacity, training kitchen, workshop, and launch an employment agency to provide vulnerable young people with access to the labour market. The farm is being redeveloped as an eco-farm to provide a sustainable source of low cost, healthy, organic food and provide vocational training opportunities to young people who would otherwise be jobless and homeless. AMURT UK has assisted AMURT Romania with fundraising to cover on going operational costs to keep this life changing facility open. 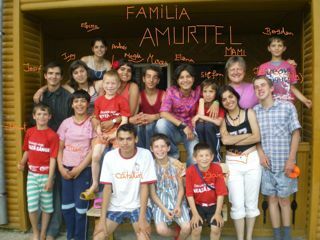 Romania is also home to a thriving AMURTEL chapter. Founded in 1995 by a group of local and international women volunteers. After analysing the needs in post communist Romania, the group decided to specialise in inclusive education for children with special needs and social services for abandoned children and youth. Since then the chapter has founded two holistic kindergartens in Bucharest, a community-supported agricultural organic farm that provides food and work experience to disadvantaged young people and the Fountain Of Hope after school centre. The centre offers hot meals, homework support and extracurricular activities economically disadvantaged schoolchildren.